All new posts are now located at www.liciouslunches.com. 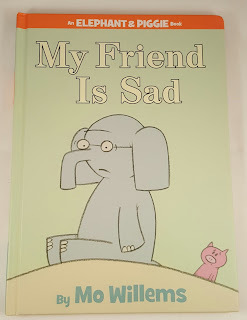 For our third lunch inspired by Mo Willems's books, we chose My Friend Is Sad from the Elephant & Piggie Collection. 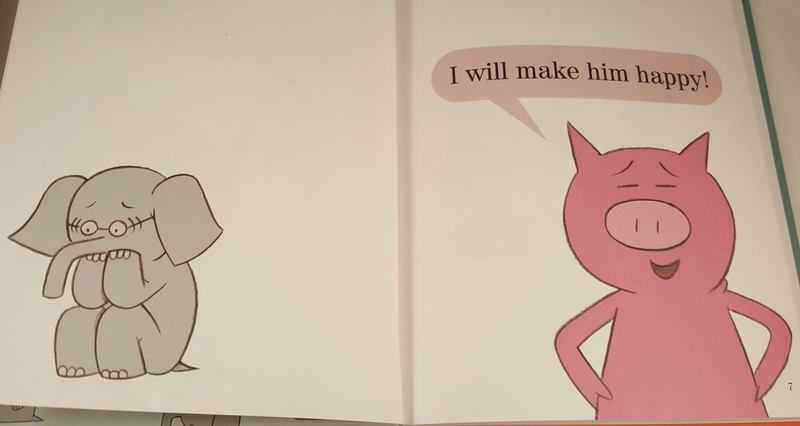 This is a sweet story about one friend trying to cheer up another. 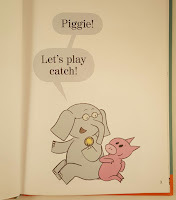 Like other Elephant and Piggie books, the outcome involves a little twist of the story. I packed this lunch in our blue Sassy box. 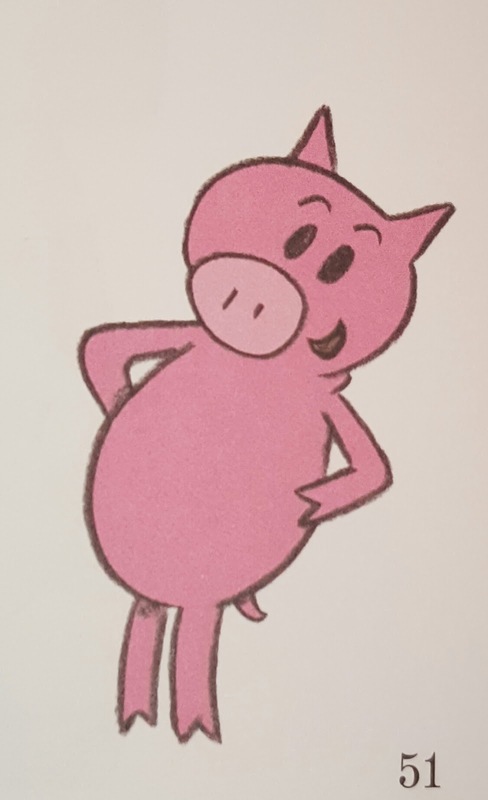 I selected picks to represent the various costumes Piggie wears throughout the story. I included cowboy boot and cowboy hat skewers holding grapes and tomatoes representing Piggie's cowboy costume, a clown pick on a strawberry for when Piggie dresses up as a funny clown, and a robot ring for Piggie's final attempt to cheer-up Elephant Gerald by dressing up as a robot. Above those picks, I placed a sad and happy face to represent the emotions that Gerald cycles through during the story. 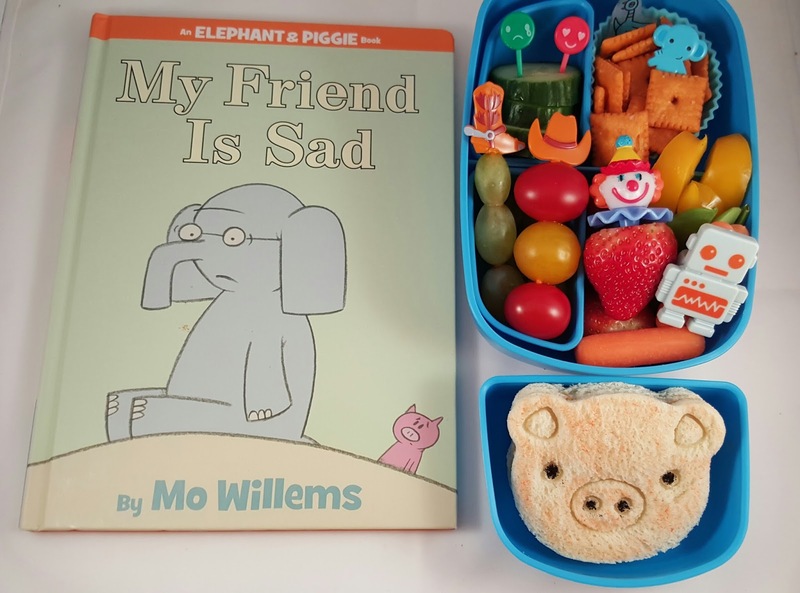 I also included a little blue elephant pick as Gerald, and if you look closely, you will see my homemade pigeon pick that is showing up in our Mo Willems' inspired lunches. The Sassy box comes with three inner boxes. I used two to create sections within the box as you see above and I used the larger inner box to hold the "Piggie" peanut butter sandwich you see below. 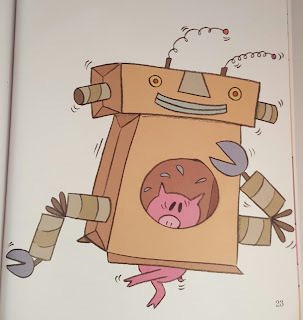 Since Piggie dresses up throughout this story, my daughter and I thought featuring her in the sandwich would be appropriate. 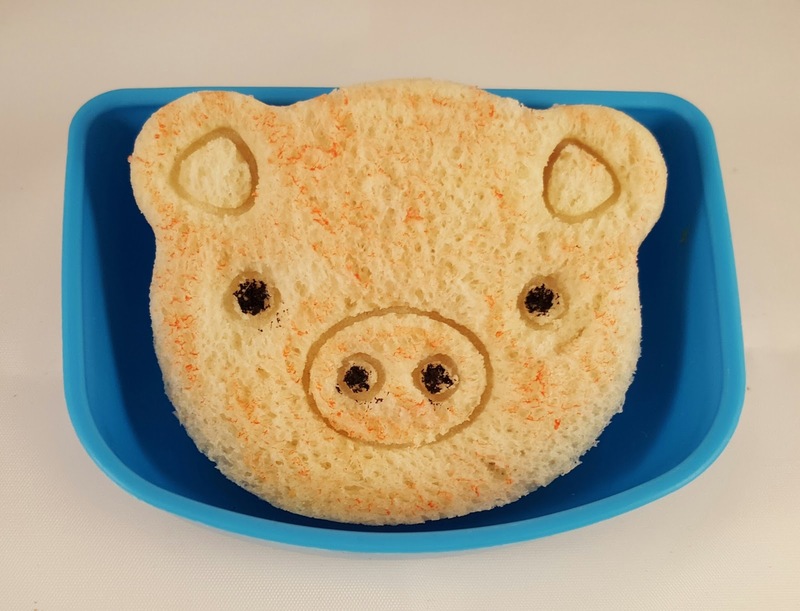 I used my Cute-Z-Cute cutter and press to make the sandwich in this shape and then accented it with food safe markers. 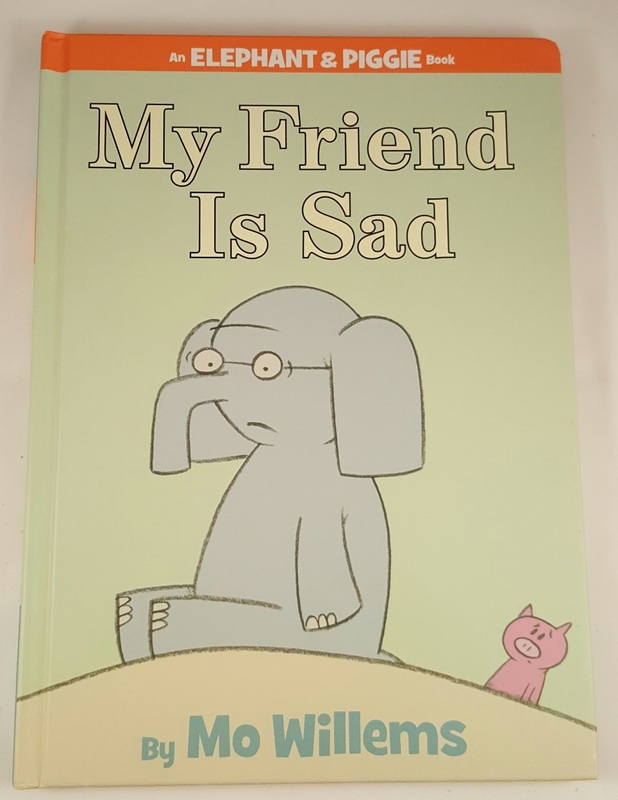 My Friend Is Sad is a sweet book from the Elephant & Piggie Collection. 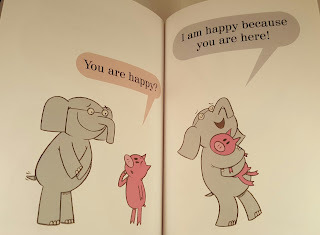 It has a nice message about how we can enjoy our happy experiences the most when we are with a friend with love. 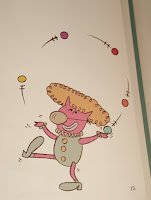 My kids have always enjoyed the illustrations in this book, especially my son who loves costumes and dress-up. Today, I will feature my second lunch inspired by books by Mo Willems. I decided to choose an Elephant & Piggie book for my second in lunch in this series and picked Can I Play Too? 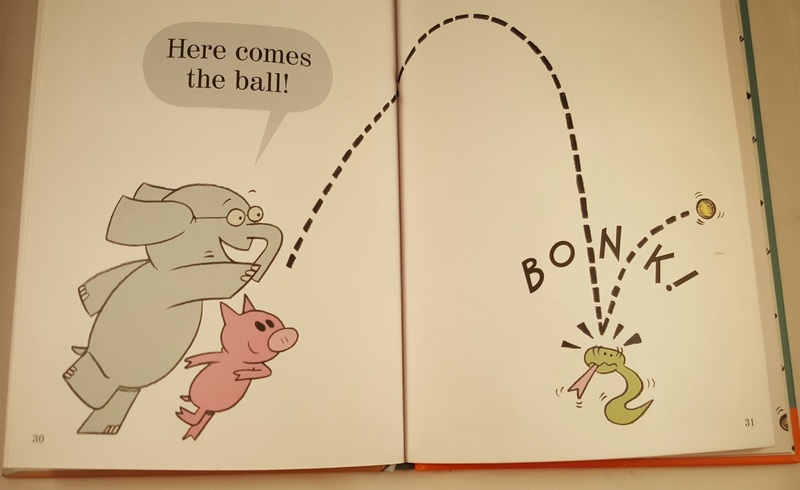 partly because I always liked the twist at the end in this one and partly because my kids have always liked snakes. This story is about a snake who wants to join Elephant and Piggie in a game of catch, but finds his lack of arms makes things difficult. 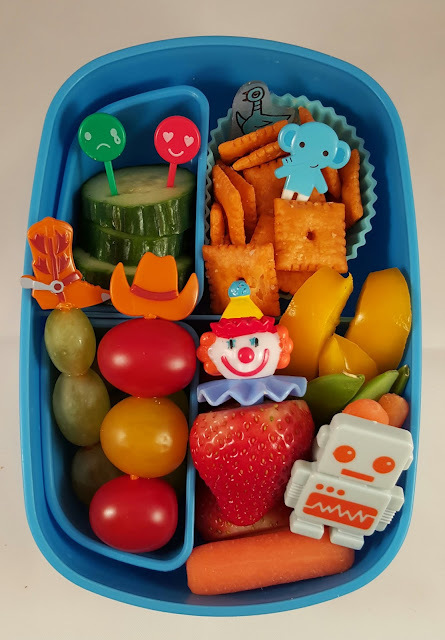 I used a two tier blue bento box for this lunch. One tier held veggies and strawberries. 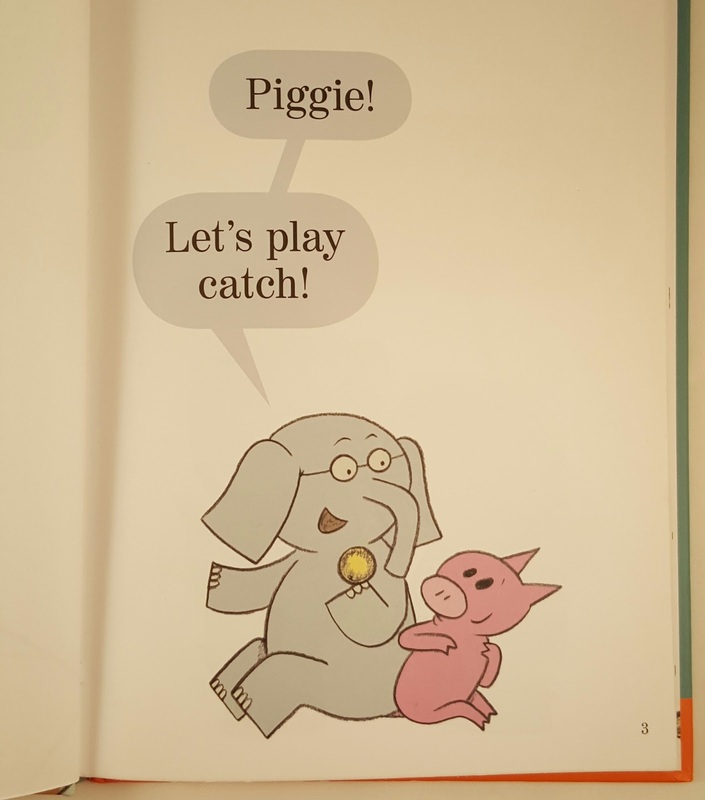 I added an elephant pick to represent Elephant Gerald and a pig pick to represent Piggie. Between them, I placed a little blue snake to represent one of the early scenes of the book where Snake is preparing to try to play catch. I used little soccer balls all around him to represent the part where they decide to try more balls. 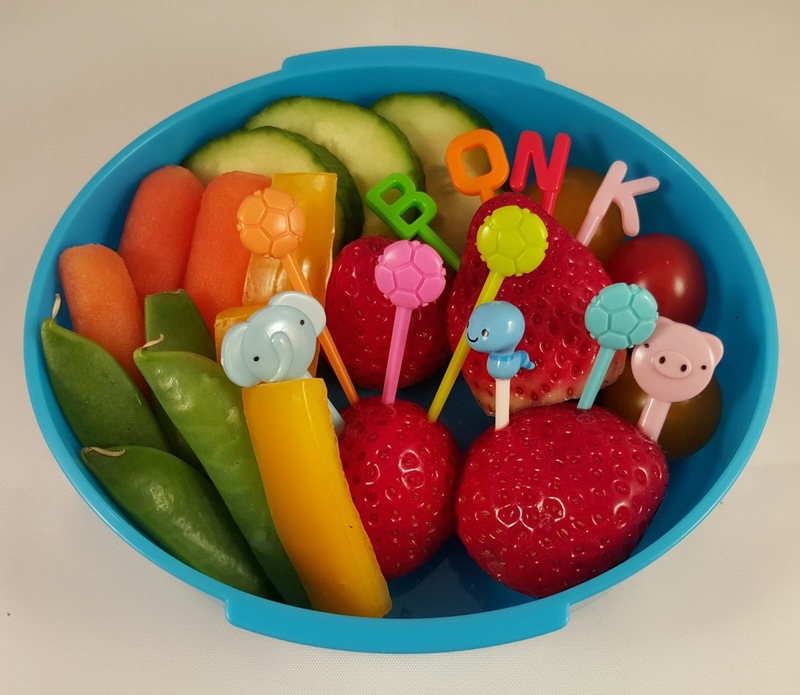 I also used letter picks to spell BONK. In the other tier of the box, I featured catcher's mitts since the story is about playing catch. I used my Sports Lunch Punch (currently on sale on Amazon for $4.99 - a great deal!) 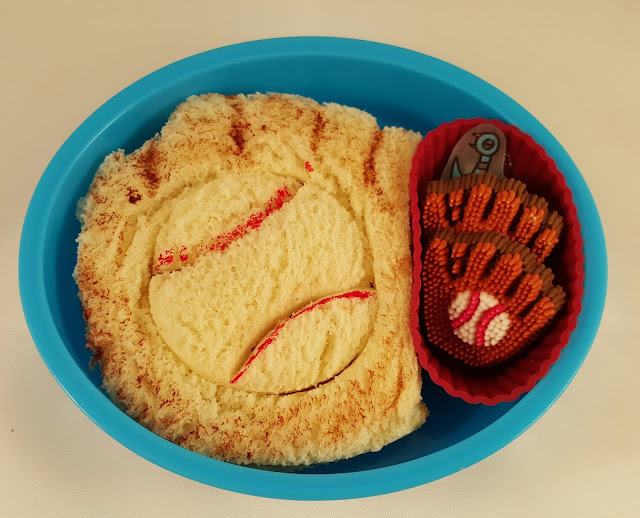 to make a peanut butter sandwich shaped like a catcher's mitt with a baseball inside. I used food safe markers to accent the features. I also included two catcher's mitt icing candies on the side. I was lucky to have these on hand! My husband bought them for me a while ago and remembered they were in the cabinet when I was packing this. They were perfect. 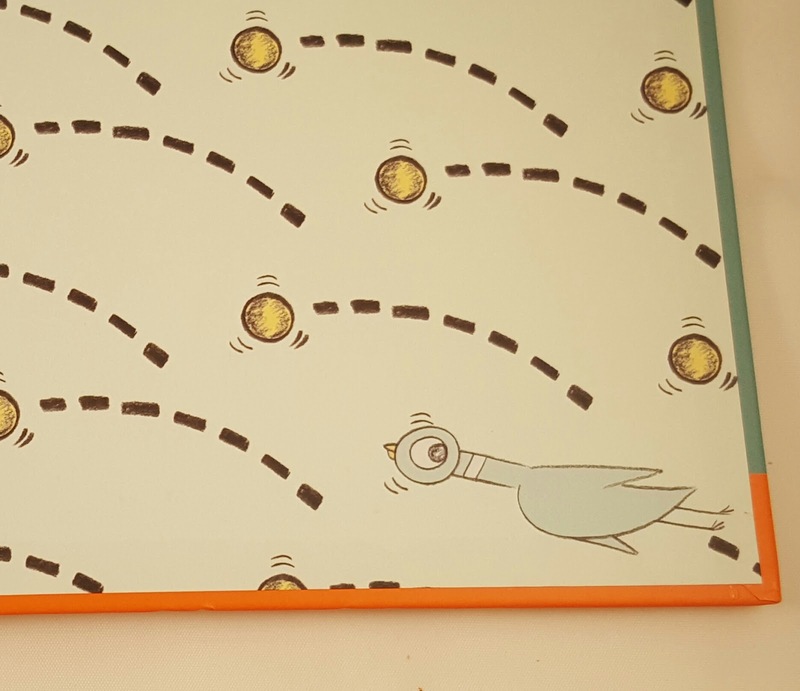 Behind the candies, you can see my pigeon pick peeking out; check out the first post in my series to read about him. I highly recommend the Elephant & Piggie books. 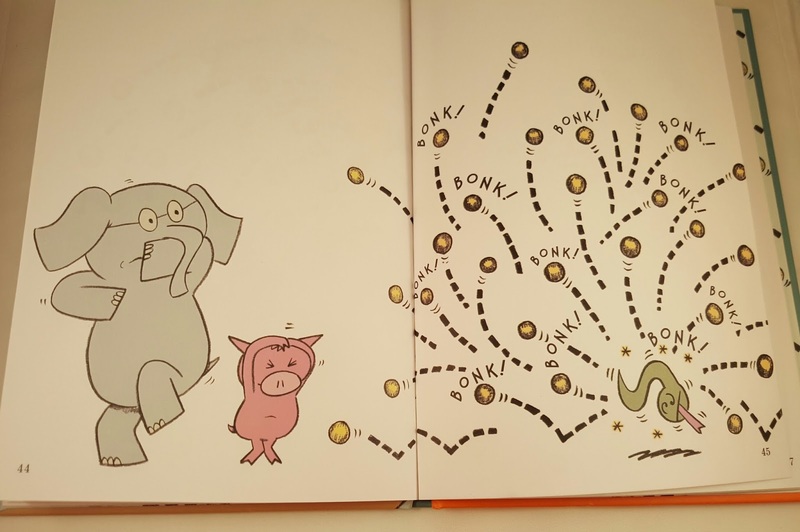 Each one has a good message, but the messages come across through the illustrations and words in a casual way as the reader relates to the characters. 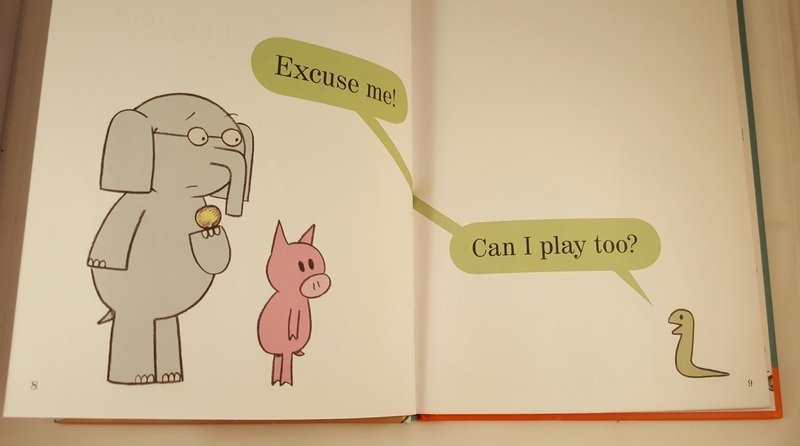 In Can I Play Too?, including others, trying, keeping a positive outlook, and finding a solution are all all modeled for children. 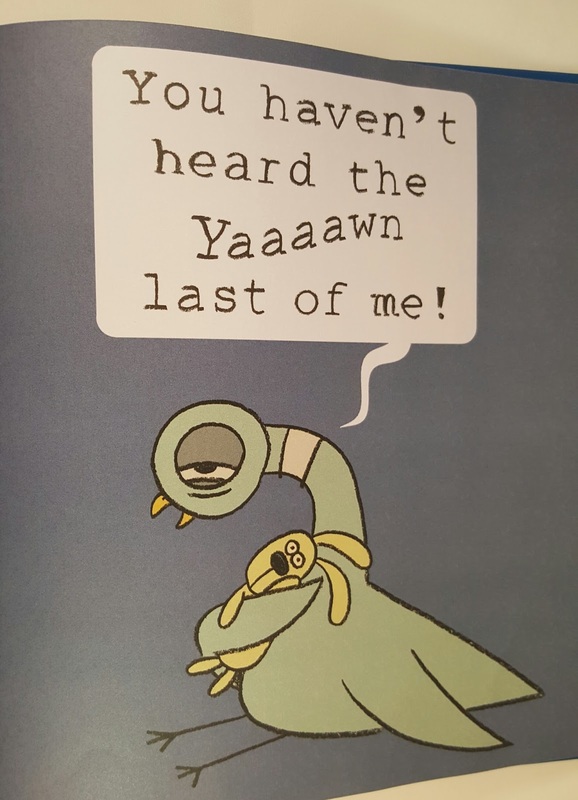 Plus, the twists at the ends of the books are always fun. 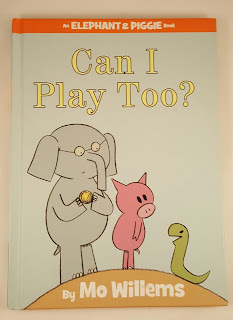 I suggest you check out Can I Play Too? 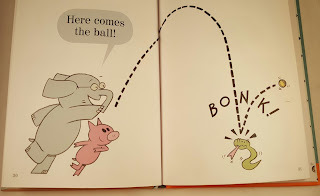 so you can see how Elephant Gerald and Piggie figure out a way to allow Snake to join the game of catch. 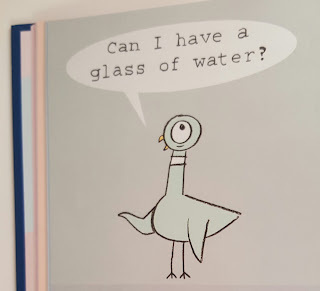 Please check back soon, I have already packed a third Mo Willems Inspired lunch and I will post it soon. 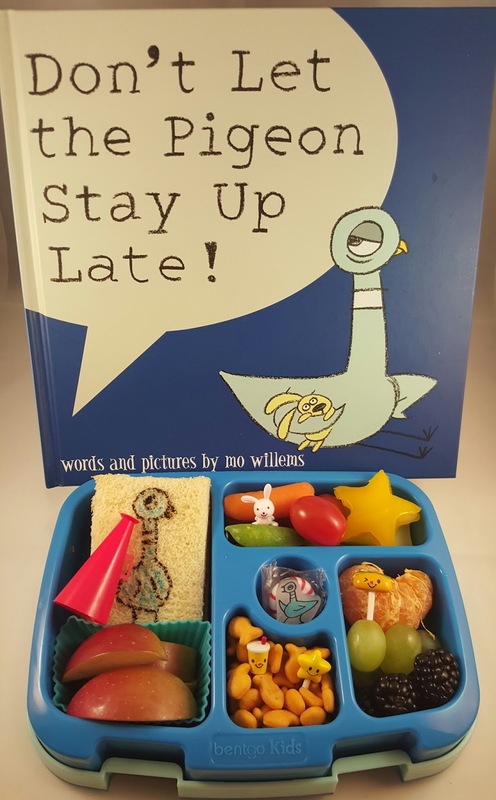 A Lunch Inspired by Mo Willems' Don't Let the Pigeon Stay Up Late! 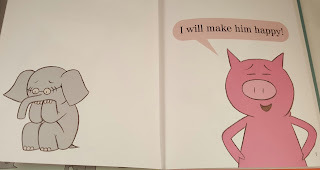 My kids love all the books by Mo Willems. In fact our collection of his books take up an entire section of our bookshelf! Since they love his books, especially the Gerald and Piggie books, and they have been such a part of their childhood, I have been planning a series of lunches featuring the books as inspiration for the lunch theme. 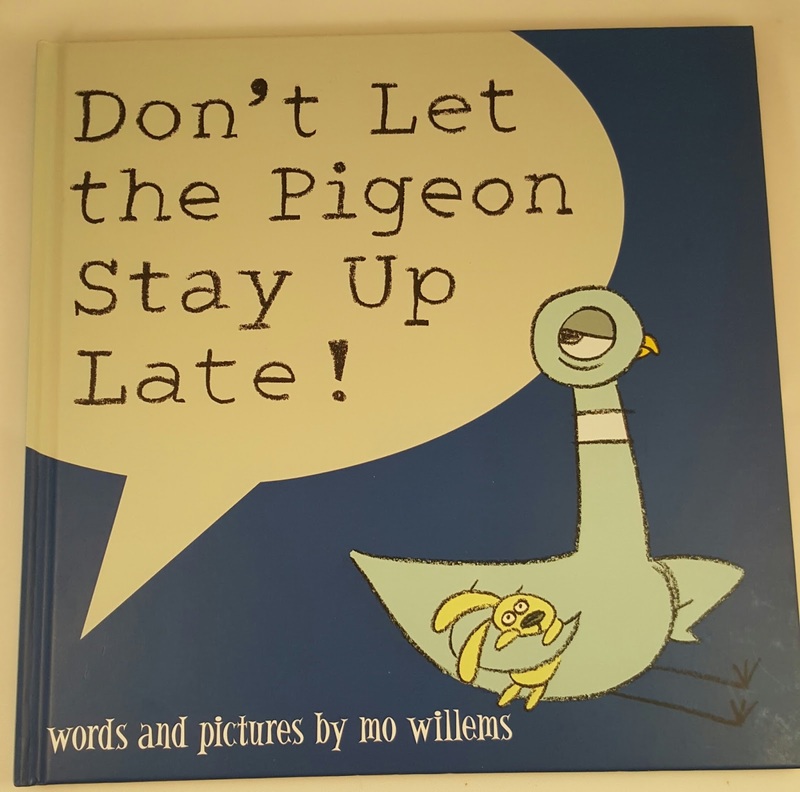 Over the weekend we read Don't Let the Pigeon Stay Up Late! 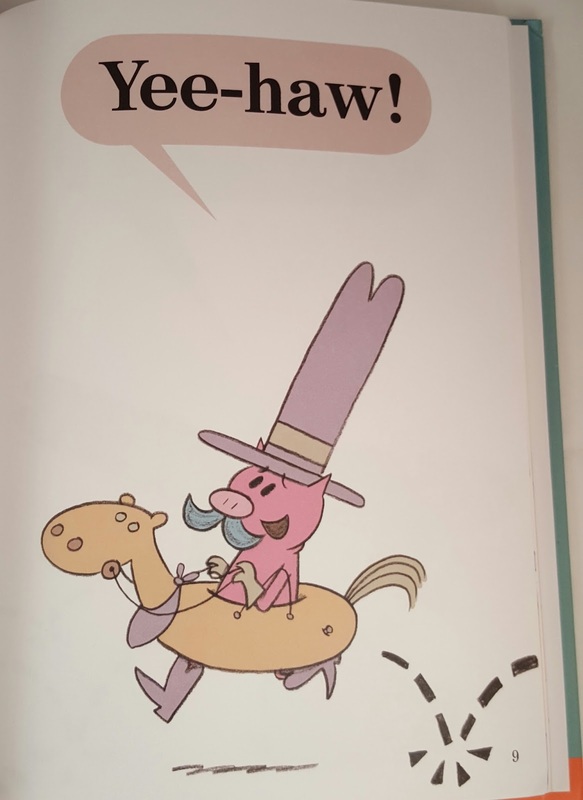 again and my daughter was excited to have a lunch featuring this book this week. 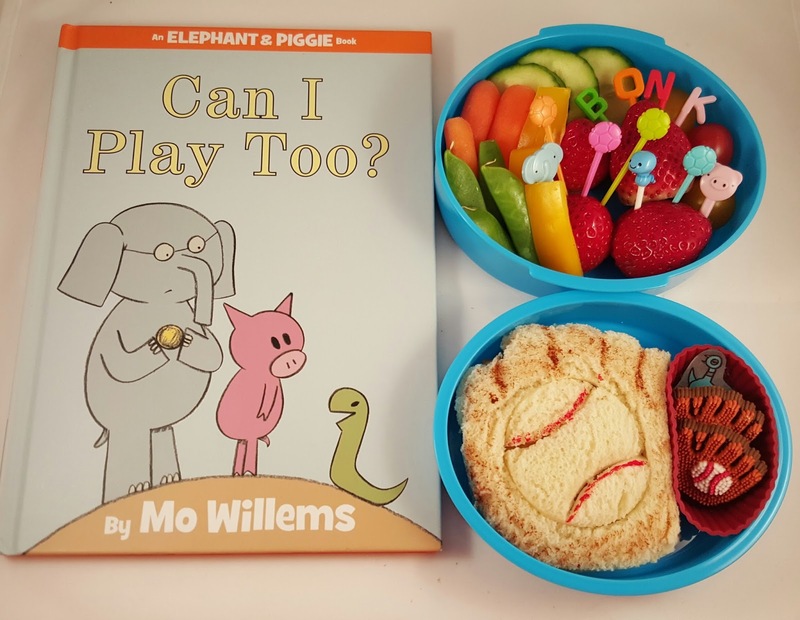 So, since today is National Read Across America day, I decided this was the perfect time to initiate our Mo Willems Book Inspired Lunch Series. 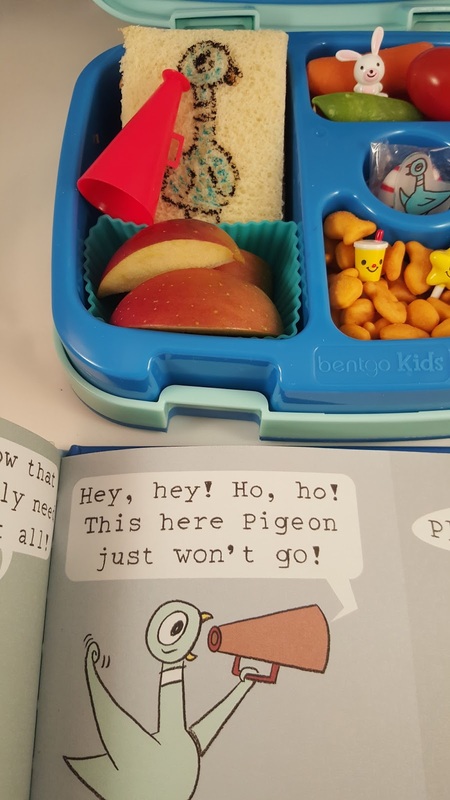 I selected our blue Bentgo Kids box for this lunch because I wanted a blue box to coordinate with the pigeon. In it, I packed a peanut butter sandwich, apple slices, crackers, fruit, veggies, and a peppermint. 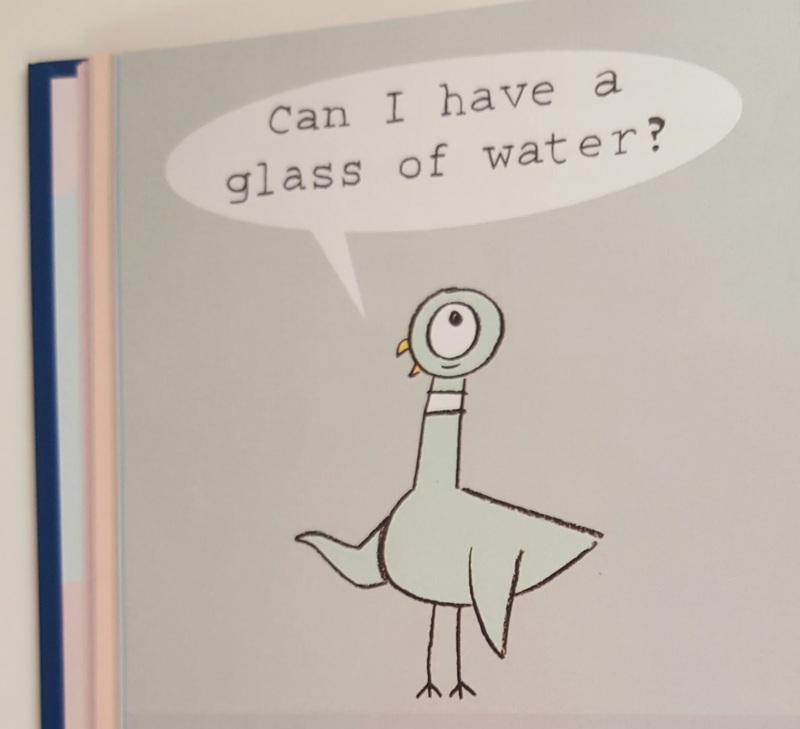 I used food safe markers to draw a picture of the pigeon and I added a red megaphone inspired by one of the images of the book. 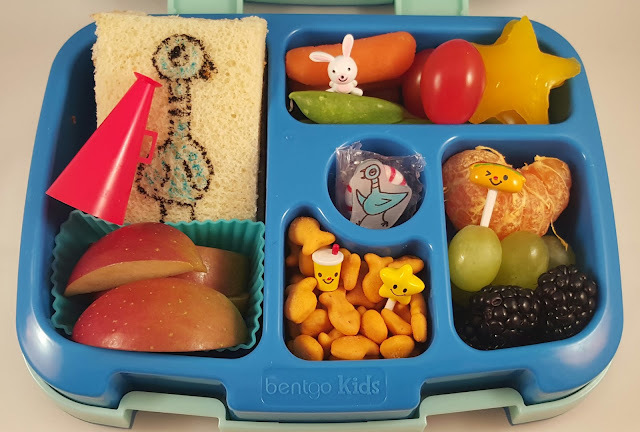 I was lucky to have this cute little bunny pick on hand from a set of bento picks. It is a really close match to the super cute images of the pigeon's stuffed animal included throughout the book. 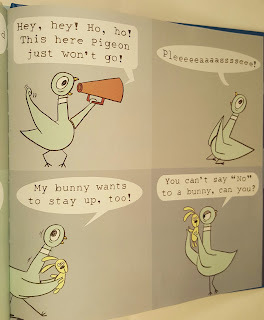 I love how the illustrations in this book show the increasing exhaustion that the pigeon is experiencing as he tries to stay up late and the way the tiredness is reflected in his little bunny as well. 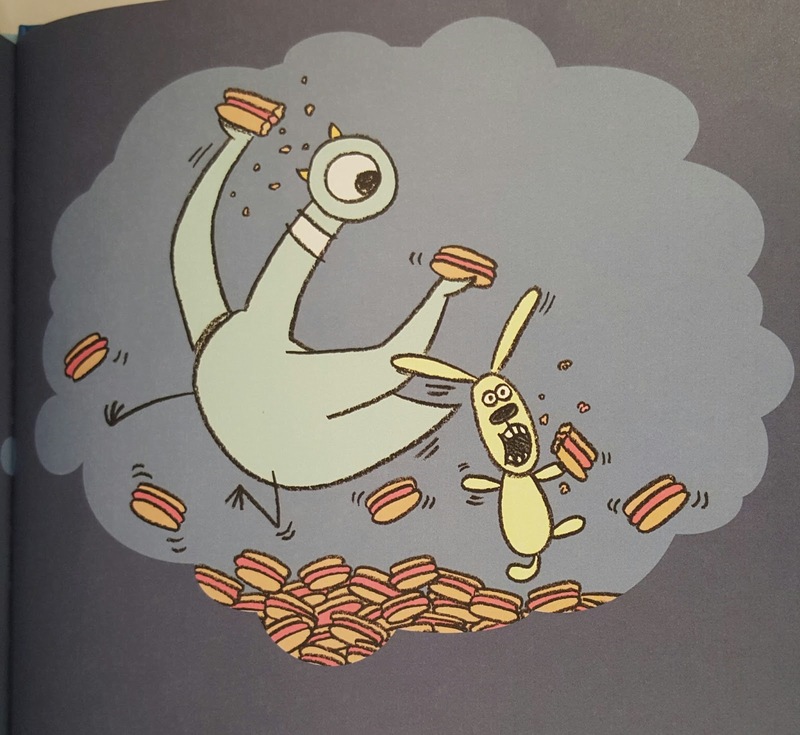 I added this cute little hot dog pick to represent the end of the book where the pigeon dreams of a hot dog party. 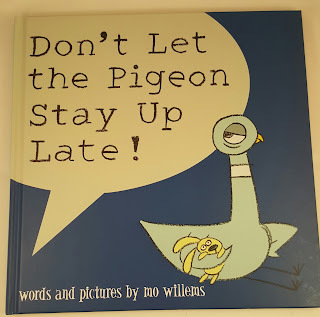 Don't Let the Pigeon Stay Up Late! 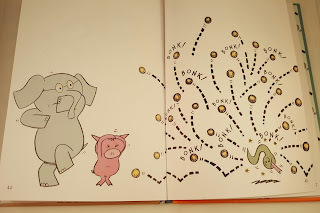 is such as fun book and I hope my daughter enjoyed recalling it today during lunch. She and I had fun planning the lunch to see what features we could represent. And, if you noticed the little pigeon in the treat section of the lunchbox, he was the suggestion of my husband. Since the pigeon shows up in other books by Mo Willems and because I hope to do a whole series of lunches based on Mo Willems' books, my husband thought it would be fun to make a pigeon that can be included in all the lunches to come. 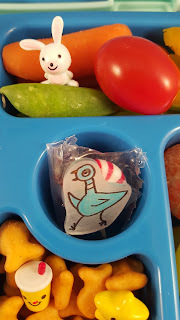 I thought this was a fun idea, so I used Shrinky Dink paper to created a food pick, like I have done before here and here. The little pigeon pick is sitting on top of a couple of peppermints. My daughter loves those! 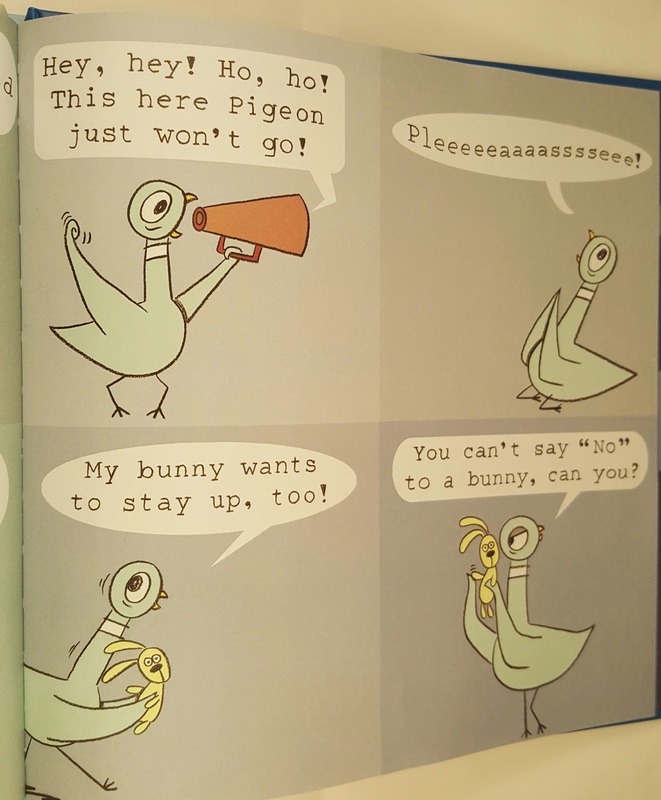 If you haven't read Don't Let the Pigeon Stay Up Late! yet, I suggest you try it with your kids. 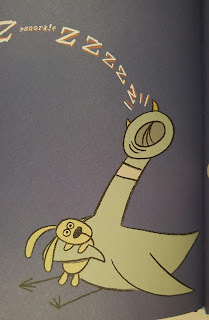 It's fun and does a wonderful job of illustrating the bedtime struggle through both works and images. 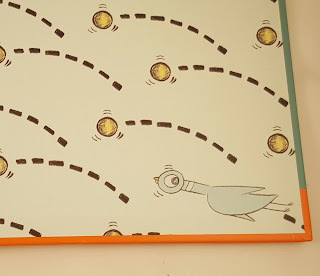 I hope you will check back in the future and follow my Mo Willems Inspired Lunch Series as it grows. Thanks for reading today's post. 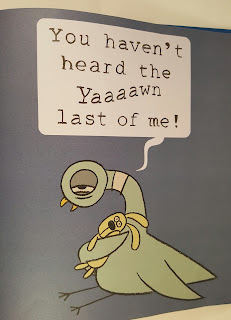 Have a happy National Read Across America Day. 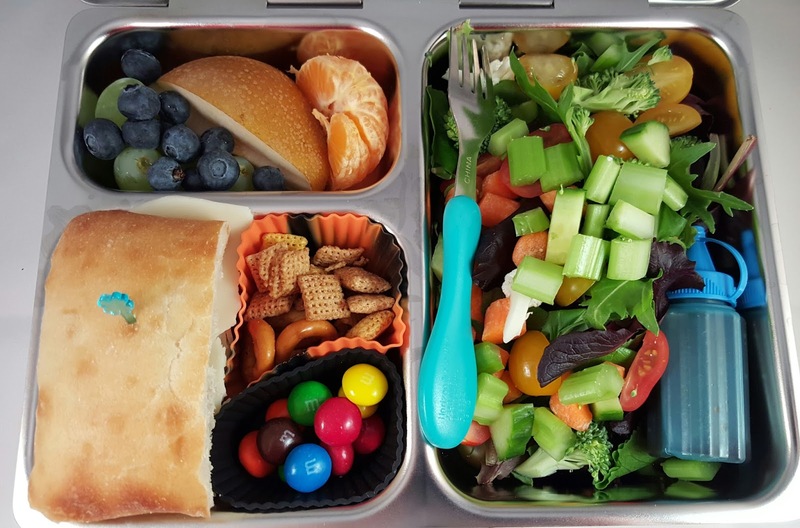 When packing lunches, I often find that the process will go faster if I prepare lunches in pairs such that I make nearly the same thing for my two kids and nearly matching lunches for me and my husband. This way, I can get four lunches (or sometimes more) packed efficiently. In demonstration of this, I will share six lunches in today's post. The first two lunches (shown above and below) were for me and my husband. Both are packed in Planetbox Launches. 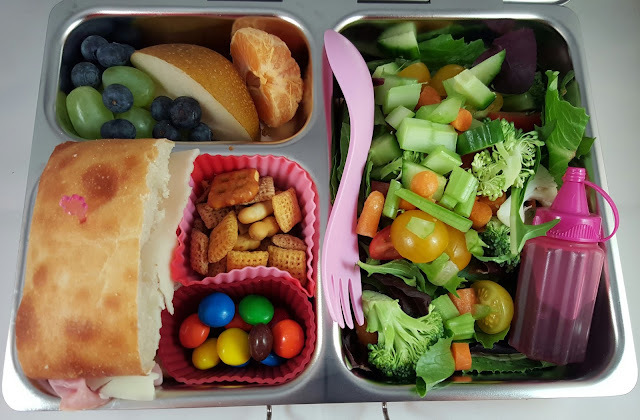 Each contains a salad in the large section to the right, grapes, blueberries, Asian pear slices, and half a Cutie in the top left compartment, along with half a sandwich, a small amount of Chex mix, and a few peanut butter M&Ms. Mine contains a pink Light My Fire fork as well as balsamic dressing in a Sistema container. I have had these salad dressing containers for nearly two years and used them often. They are very handy for sending salad dressing along with lunch and they are durable. Mine are still like new even though they have been used frequently. The next two lunches are also for the adults in our family. These are packed in Goodbyn Bynto boxes. We have had these boxes for three years now and they have also held up very well. We have used them about once a week. I like using these for times when I want to place salad in a separate section from other foods as you see below. In this lunch, we have one section with fruit, one with half a sandwich, crackers, and a cookie, and the last section with the salad and a small container of salad dressing. The Goodbyn Bynto is no longer available, but if you like the layout of this box, you might try the Goodbyn Hero. 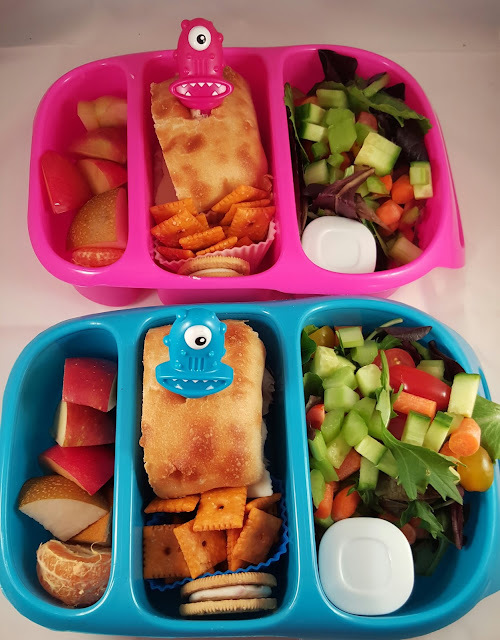 I also stuck a couple of monster picks into these lunches simply because they are cute and matched the colors of the boxes so closely. The last two lunches are for my kids. Tuesday is "Wear Green" day at my daughter's school. She is wearing a green shirt with lizards on the front. She has always liked reptiles, especially lizards as I have shared before, so they are appropriate for her on green day. 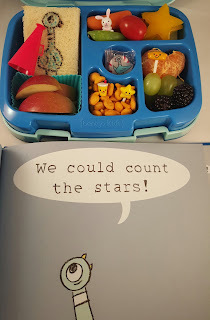 To coordinate with "Wear Green" day, I decided to use our green Yumbox for her lunch. In it, I packed tomatoes, carrots, celery, apple slices, a Babybel, green grapes, crackers, blueberries, and two cookies. I added a few green picks including an ABC pick, green crayons, a computer, a turtle, a frog, and a lizard. 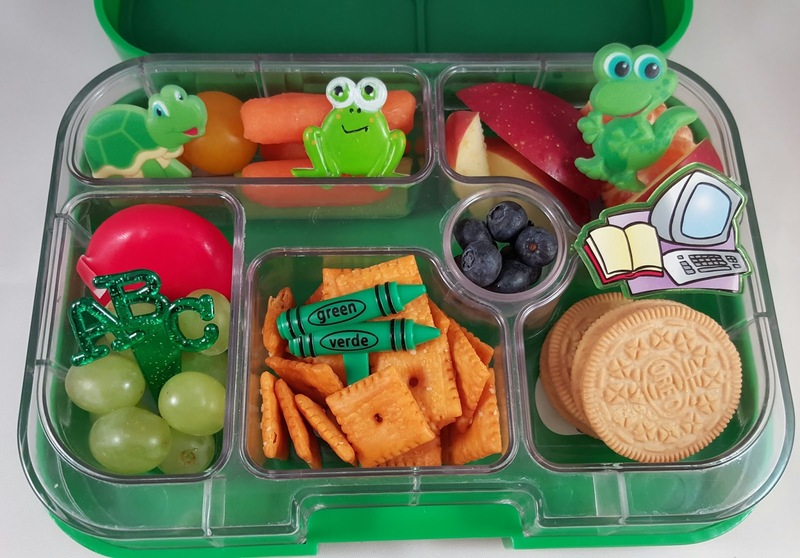 My friend Amy, from Yummy Bites by Amy shared the turtle, frog, and lizard picks with me. 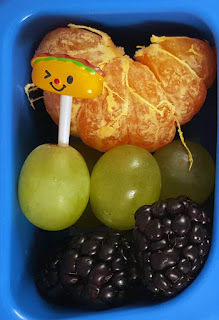 To make the lunch packing process easier and faster, I packed many of the same foods for my son in a different color Yumbox. 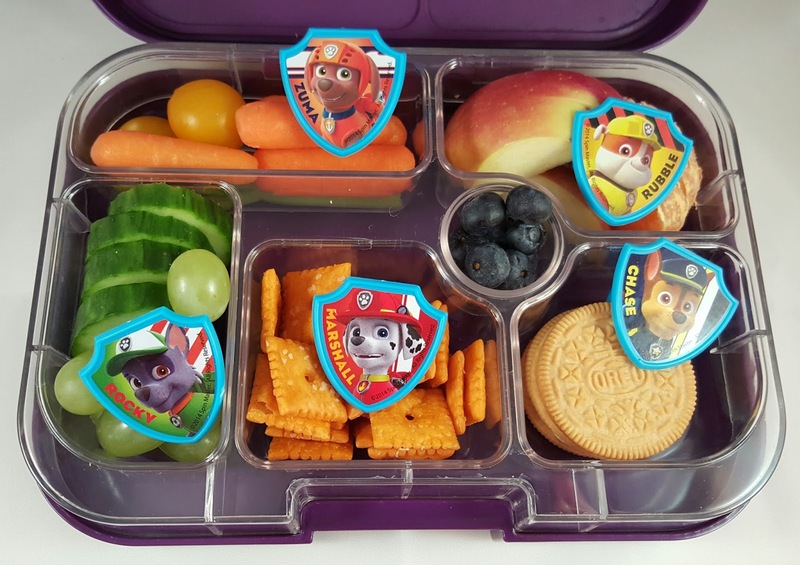 Then, I added Paw Patrol rings since he is a big fan of Paw Patrol and enjoys getting those featured in his lunches. I have my friend Perry, at Dreams, Schemes, and Bento Themes, to thank for this set of Paw Patrol rings. This week my daughter's school is having a spirit week in celebration of reading. Each day they are encouraged to wear something specific. Monday was designated as "Wear a T-Shirt You Can Read Day". I decided to have have a little fun with this in her lunch. I stamped her peanut butter sandwich with "A Sandwich You Can Read". She saw me preparing this and seemed to think it was funny and cool. 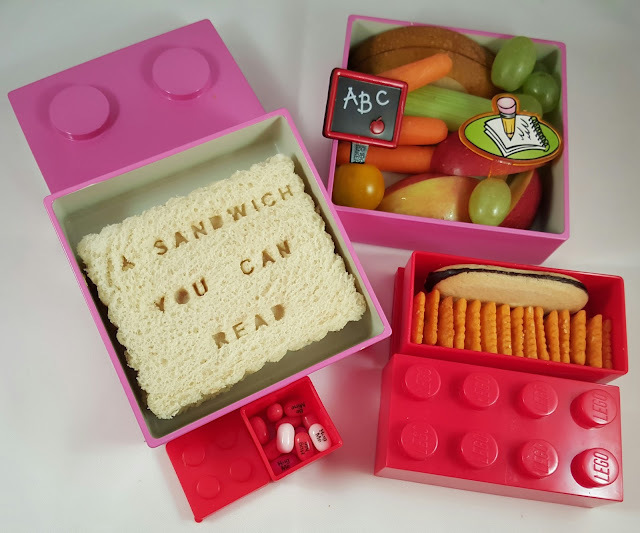 I packed the sandwich in one tier of our pink Lego like bento box. I like to use two tier boxes when I pack peanut butter sandwiches for her because it's easy to keep one tier at room temperature overnight while the other tier is stored in the refrigerator. The second tier here contains slices of Asian pear, green grapes, carrots, celery, apple slices, and tomatoes. I added an ABC pick and a notepad pick to go along with the reading theme. 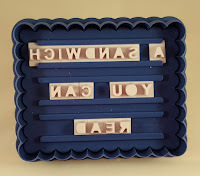 I packed crackers and a cookie in a small red Lego container and in the smaller red container, I added a few Tic Tacs with words for "Candy You Can Read". I stamped the sandwich with letters from this Cookie Notes Cookie Cutter set. 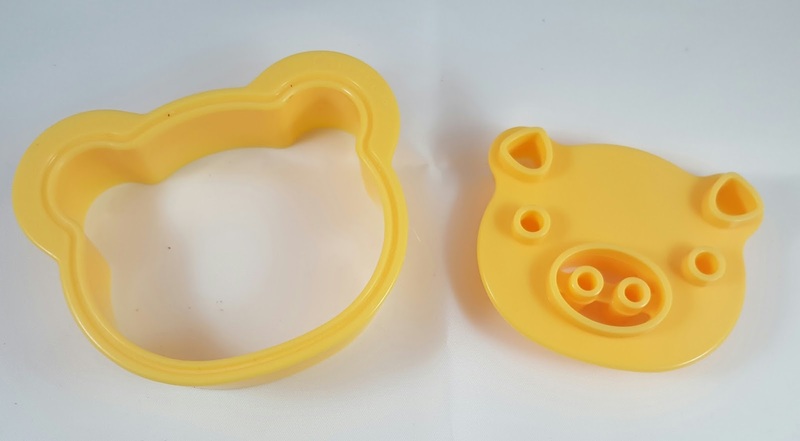 It comes with three different cookie cutters and each has tracks for holding letters. You can see the tracks and the letters in the image to the side. This allows you to create any kind of message you like. 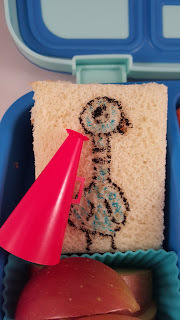 My daughter really likes the individual, unique nature of the idea that it can be used to create any kind of sandwich message. Since my son attends daycare at a different school, he is not celebrating the same days this week. 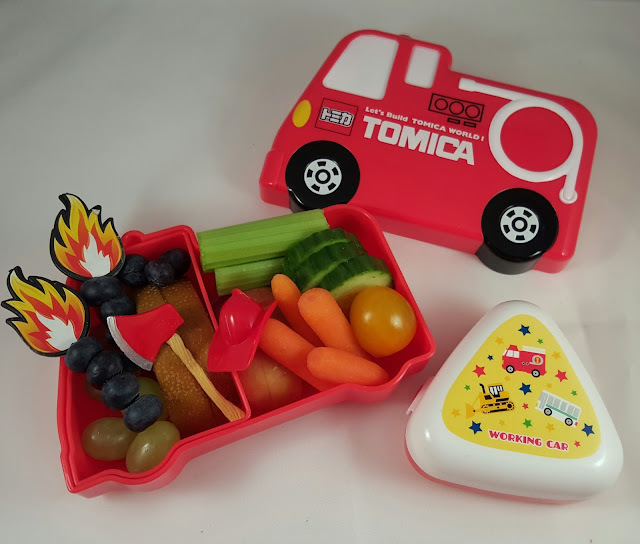 But, I still wanted to pack a themed lunch matched to his interests, so I decided to use our special firetruck bento box. He has fruits and veggies accented with flame picks, a fireman's ax, and a firefighter hat. In the little box to the side, he has crackers and I will include a tube of yogurt too when I place this in his firetruck lunch bag. If you know a child who loves firetrucks, be sure to visit my post on our recent firetruck birthday party. You'll find lots of ideas for food, decorations, activities, and favors. Today was National Tooth Fairy Day and we celebrated with a simple, but fun breakfast. 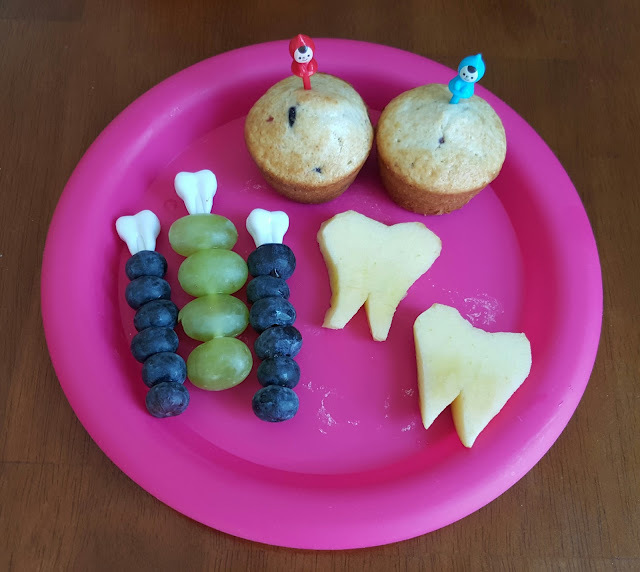 My kids had berry muffins with little fairy picks, blueberries and green grapes on tooth picks, and apple slices cut to look like teeth. I have wanted to get my hands on some of these tooth picks since I saw them a few years back on this post over on Bent on Better Lunches. But, for a long time I never saw them for sale anywhere. Recently, my friend, Amanda, at Bento Ninja found some and she was nice enough to let me share an order with her.